Grannis & Hauge, P.A. dates its origins to the founding of the Grannis & Grannis firm in 1908, which served Dakota County and the surrounding area until 1990, when it merged with the firm of Hauge, Eide, Anderson & Keller. The firm's mission is to serve the community by delivering ethical, high quality legal services to individuals, businesses and cities. What insurance benefits am I entitled to? How do I document my injuries? Who will pay my medical bills if I cannot? Who is responsible for compensating me for my injuries and losses? Attorney: Michael Dwyer is licensed to practice in the state and federal courts of Minnesota and Wisconsin. Choosing the best form for a new business: Sole Proprietorship, General or Limited Partnership, Limited iability Company, "S" or "C" corporation. Typical representation for forming a new business includes meeting with the owner(s), choosing the form of entity for the business, e.g., corporation or limited liability company, drafting and filing documents with the Secretary of State to establish the business as a legal entity, obtaining a federal tax identification number, drafting beginning resolutions to establish ownership interests, officers and directors and to make necessary tax elections, registering for a Minnesota tax identification number and preparing an initial set of books and records for the new business. Additional organizing measures can include preparation of bylaws, member control agreements, buy-sell agreements and financing agreements. In addition to its Business Law department, the firm offers the services of experienced tax attorneys. Services include preparation of personal and business tax returns, tax planning to minimize adverse tax consequences, planning the optimal organization structure for business, and handling disputes with tax authorities. Our attorneys represent clients in procedures and disputes involving the Internal Revenue Service, the Minnesota Department of Revenue and the Minnesota Department of Economic Security, involving both business and individual tax disputes and audits. Attorneys: Ward R. Anderson, Rebecca S. Christensen and Barry Wittenkeller. Grannis & Hauge's attorneys have helped many thousands of clients develop appropriate estate plans and administer probate estates, guardianships and conservatorships. Successful estate plans are tailored to individual needs and can include a will, one or more trusts, a business succession plan, a gifting program and ancillary documents such as durable powers of attorney and health care directives (living wills). Guidance in how to take title to and hold your assets can also help to avoid probate, where appropriate. 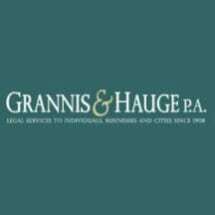 Grannis & Hauge capably attends to clients' needs resulting from ownership of real property, including representation of landowners or developers, 1031 Exchange agreements, preparation and review of purchase agreements for commercial or residential property, representation of buyers and sellers at closings, condominium organization, lease negotiations and landlord-tenant disputes. We represent clients before municipalities, and if necessary, in court challenges, on zoning matters, requests for special use permits, conditional use permits, assessment appeals and variances. Grannis & Hauge, P.A. represents clients in Debt Relief. Even before filing, you can advise a creditor that you have retained counsel, which should end debt collection calls and correspondence. We can help you deal with mortgage foreclosures. Learn what the impact is on your credit and ways to improve your scores after filing. William L. Bernard represents creditors who have customers, clients or borrowers. Family Law deals with especially sensitive issues that can have life-long emotional and financial effects. It is a specialized area of law, requiring specific training, negotiation and litigation skills, knowledge of taxation, property law, and business evaluation as well as up-to-date knowledge of the constantly changing rules and procedures in the family law area.